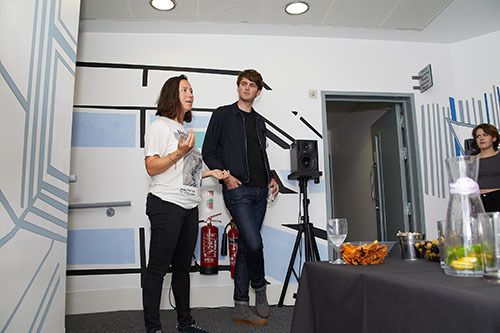 Visitors to City, University of London have joined staff and students to create a new audio-visual art installation in the Department of Music. 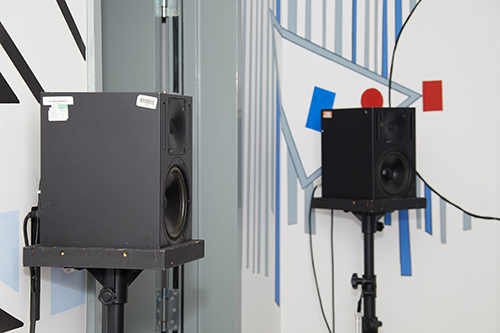 Over a period of several months, participants recorded sounds from around the department’s rehearsal, teaching, studio and performance spaces. They also designed and painted artwork on walls of the foyer at the Performance Space. Speakers have been installed in the area and the 30-minute composition of audio recordings is being played periodically into the room. 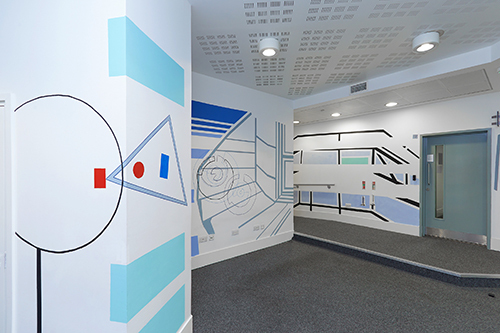 The finished audio-visual artwork reflects the history, current profile and possible futures of the department, taking inspiration from the architecture of the building and activity happening within it. 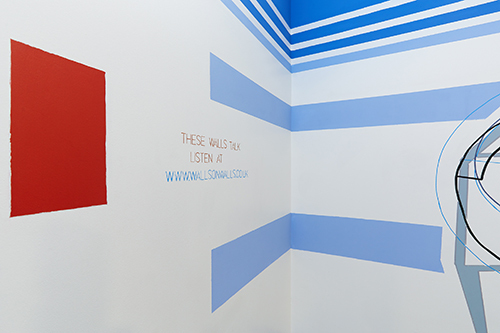 The work was facilitated by Walls On Walls, a collaboration between Dr Tullis Rennie, who is a composer and City music lecturer, and artist Laurie Nouchka. Dr Rennie said: “The idea of this project was that anybody in the City community was able to participate – we asked people to pick up paint brushes, explore the area to make recordings and help edit the audio. “It’s a unique installation because a lot of participative art projects are visual but don’t involve sound. With this work, the group wanted to open up some of the hidden spaces in the department and record sounds that most people are not privy to." The installation is part of Dr Rennie’s practice-based research into collaborative arts process. Practice-based research is a type of study where the aim is to develop knowledge through creative activity. Dr Rennie’s objective was to observe participation in the creation of an audio-visual community project and see how this translated into the final artwork. He said: “Participants were taken on a tour and recorded sound from lots of different areas, including the corridors, empty concert rooms, the spaces between rehearsal room and behind doors that are normally closed." Dr Rennie added: “They also had electro-magnetic equipment that they could use to record sounds from the wires around the department that connect various studio spaces. “Students were able to access and edit the recordings themselves and we held an open listening group where everybody could voice opinions.” The artwork is now a permanent installation in the Department of Music. It was launched at an open public event on Wednesday 30th May 2018. Dr Rennie recently received a commendation for his work with Walls On Walls in the Outstanding Contribution to the Local Community category of the university's President's Awards.